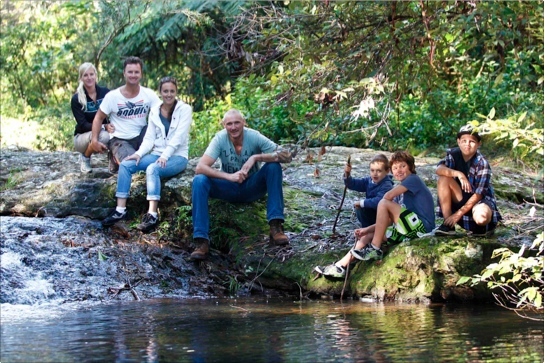 The Ocean Road cast and crew head to Purling Brook Falls, Springbrook National Park, South East Queensland. We’re off Glamping under the care of Spida and Sheree Everett of The Great Australian Doorstep. The wintry wet and cold weather shook us up at first, but the beautiful clear morning that we awoke to made the discomfort wort it. Cast: Craig McGarry, Ethan McGarry, Harry McNeil, and Kate Davis. Crew: Photographer Brian Usher, Videographer and Editor David Smouha. Hi Lesley, thanks for your encouragement and enjoyment of the video Ocean Road Magazine Winter Photo-shoot. I had some fun reliving precious moments from our first baby (a daughter also), Mardi Rosie-Pops. I chuckle when I say her name these days. She has grown up so wise and a source of great pride and joy still, 33 years later.